Q -What is Cupping Therapy? ​A - Suction cups rapidly facilitate soft tissue release, loosens & lifts connective tissue, breaks up and drains stagnation while increasing blood & lymph flow to skin & muscles in ways not possible using compression. Another benefit of Cupping is that it can feel really great when done properly for your constitution and current physiology and/or condition. The pulling action engages the parasympathetic nervous system, thus allowing a deep relaxation to move through the entire body. Negative pressure, rather than tissue compression is superior for bodywork for pain, stubborn conditions, repetitive strains, inflammation, toxicity, chronic fatigue, digestive problems and a slough of other issue we confront as we grow older. A - Health practitioners of many modalities are using Cupping to assist them in providing more effective methods for healing and recovery. Massage Therapists, Acupuncturists, Physiotherapists, Sports Therapists, Nurses, Doctors, Reflexologists and more. Q - What can I expect as far as physical effects from suction cup therapy? feelings of being "hung over"
Q - What's the explanation of the marks or discolorations that sometimes occur as a result from suction cup therapy? ​A - One of the common misconceptions concerning cupping is that any discoloration experienced after treatment is “bruising”. Bruising is caused by trauma with breakage of capillaries and rush of fluids to the damaged area from the tissue compression or injury. During Stationary Cupping where cups are left static for 5 - 20 minutes, marks or discolourations may occur. Often, when a condition exists within deeper structures of the body where sufficient pathologic factors and stagnant fluids (toxins, blood and lymph) are dredged up during treatment, discoloration will appear on the skin. This is the therapeutically desired effect – the more this is visible, the greater the level of stagnation and toxicity. The discoloration will fade over a few days. As treatments cummulate and the release of stagnation has been dispursed and drained – (usually by the 3rd or 4th treatment) no discoloration is likely to occur. Even though each time the cupping may have been focused on the same area for the same duration and with the same amount of negative pressure. This is clearly the result of having internal unwanted toxins systematically purged. 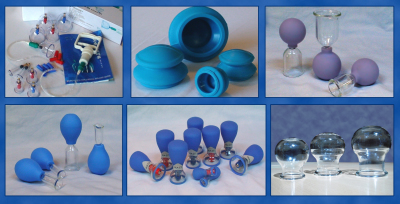 Q- What does Cupping Therapy relieve? Q- What are CONTRAINDICATIONS TO CUPPING - Who should avoid cupping? ~ Those with muscle spasms or bone fractures.